New Directions Publishing Corporation, 9780811219396, 212pp. Orpheus Descending is a love story, a plea for spiritual and artistic freedom, as well as a portrait of racism and intolerance. When charismatic drifter Valentine Xavier arrives in a Mississippi Delta town with his guitar and snakeskin jacket, he becomes a trigger for hatred and a magnet for three outcast souls: storekeeper Lady Torrance, "lewd vagrant" Carol Cutrere, and religious visionary Vee Talbot. Suddenly Last Summer, described by its author as a "short morality play," has become one of his most notorious works due in no small part to the film version starring Elizabeth Taylor, Katharine Hepburn, and Montgomery Clift that shocked audiences in 1959. A menacing tale of madness, jealousy, and denial, the horrors in Suddenly Last Summer build to a heart-stopping conclusion. 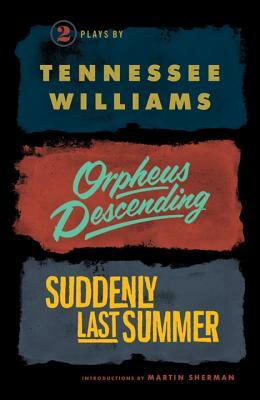 With perceptive new introductions by playwright Martin Sherman -- he reframes Orpheus Descending in a political context and explores the psychology and sensationalism surrounding Suddenly Last Summer -- this volume also offers Williams's related essay, "The Past, the Present, and the Perhaps," and a chronology of the playwright's life and works.